We Land on Mars in Just 2 days! Watch how Schiaparelli will land on Mars. Touchdown will occur at 10:48 a.m. EDT (14:48 GMT) Wednesday Oct. 19. Cross your fingers for good weather on the Red Planet on October 19. That’s the day the European Space Agency’s Schiaparelli lander pops open its parachute, fires nine, liquid-fueled thrusters and descends to the surface of Mars. Assuming fair weather, the lander should settle down safely on the wide-open plains of Meridiani Planum near the Martian equator northwest of NASA’s Opportunity rover. The region is rich in hematite, an iron-rich mineral associated with hot springs here on Earth. The 8-foot-wide probe will be released three days earlier from the Trace Gas Orbiter (TGO) and coast toward Mars before entering its atmosphere at 13,000 mph (21,000 km/hr). During the 6-minute-long descent, Schiaparelli will decelerate gradually using the atmosphere to brake its speed, a technique called aerobraking. Not only is Meridiani Planum flat, it’s low, which means the atmosphere is thick enough to allow Schiaparelli’s heat shield to reduce its speed sufficiently so the chute can be safely deployed. The final firing of its thrusters will ensure a soft and controlled landing. The lander is one-half of the ExoMars 2016 mission, a joint venture between the European Space Agency and Russia’s Roscosmos. The Trace Gas Orbiter (TGO) will fire its thrusters to place itself in orbit about the Red Planet the same day Schiparelli lands. Its job is to inventory the atmosphere in search of organic molecules, methane in particular. Plumes of methane, which may be biological or geological (or both) in origin, have recently been detected at several locations on Mars including Syrtis Major, the planet’s most prominent dark marking. The orbiter will hopefully pinpoint the source(s) as well as study seasonal changes in locations and concentrations. Long-extinct bacteria that released methane that became trapped in ice or minerals in the upper crust. Changing temperature and pressure could stress the ice and release that ancient gas into today’s atmosphere. Abiological sources. Iron can combine with oxygen in terrestrial hot springs and volcanoes to create methane. This gas can also become trapped in solid forms of water or ‘cages’ called clathrate hydrates that can preserve it for a long time. Olivine, a common mineral on Earth and Mars, can react with water under the right conditions to form another mineral called serpentine. When altered by heat, water and pressure, such in environments such as hydrothermal springs, serpentine can produce methane. Will it turn out to be burping bacteria or mineral processes? Let’s hope TGO can point the way. The Trace Gas Orbiter will also use the Martian atmosphere to slow its speed and trim its orbital loop into a 248-mile-high (400 km) circle suitable for science observations. But don’t expect much in the way of scientific results right away; aerobraking maneuvers will take about a year, so TGO’s job of teasing out atmospheric ingredients won’t begin until December 2017. The study runs for 5 years. The orbiter will also examine Martian water vapor, nitrogen oxides and other organics with far greater accuracy than any previous probe as well as monitor seasonal changes in the atmosphere’s composition and temperature. And get this — its instruments can map subsurface hydrogen, a key ingredient in both water and methane, down to a depth of a meter (39.4 inches) with greater resolution compared to previous studies. Who knows? We may discover hidden ice deposits or methane sinks that could influence where future rovers will land. Additional missions to Mars are already on the docket, including ExoMars 2020. More about that in a minute. While TGO’s mission will require years, the lander is expected to survive for only four Martian days (called ‘sols’) by using the excess energy capacity of its batteries. A set of scientific sensors will measure wind speed and direction, humidity, pressure and electric fields on the surface. A descent camera will take pictures of the landing site on the way down; we’ll should see those photos the very next day. Data and imagery from the lander will be transmitted to ESA’s Mars Express and a NASA Relay Orbiter, then relayed to Earth. This animation shows the paths of the Trace Gas Orbiter and Schiaparelli lander on Oct. 19 when they arrive at Mars. If you’re wondering why the lander’s mission is so brief, it’s because Schiaparelli is essentially a test vehicle. Its primary purpose is to test technologies for landing on Mars including the special materials used for protection against the heat of entry, a parachute system, a Doppler radar device for measuring altitude and liquid-fueled braking thrusters. Martian dust storms can be cause for concern during any landing attempt. Since it’s now autumn in the planet’s northern hemisphere, a time when storms are common, there’s been some finger-nail biting of late. The good news is that storms of recent weeks have calmed and Mars has entered a welcome quiet spell. To watch events unfold in real time, check out ESA’s live stream channel, Facebook page and Twitter updates. The announcement of the separation of the lander from the orbiter will be made around 11 a.m. Eastern Time (15:00 GMT) Sunday October 16. Live coverage of the Trace Gas Orbiter arrival and Schiaparelli landing on Mars runs from 9-11:15 a.m. Eastern (13:00-15:15 GMT) on Wednesday October 19. Photos taken by Schiaparelli’s descent camera will be available starting at 4 a.m. Eastern (8:00 GMT) on October 20. More details here. We’ll also keep you updated on Universe Today. Everything we learn during the current mission will be applied to planning and executing the next — ExoMars 2020, slated to launch in 2020. That venture will send a rover to the surface to search and chemically test for signs of life, present or past. It will collect samples with a drill at various depths and analyze the fines for bio-molecules. Getting down deep is important because the planet’s thin atmosphere lets through harsh UV light from the sun, sterilizing the surface. OSIRIS-REx goal is to fly on a roundtrip seven-year journey to the near-Earth asteroid target named Bennu and back. 101955 Bennu is a near Earth asteroid and was selected specifically because it is a carbon-rich asteroid. July 20. Sound like a familiar date? If you guessed that’s when we first set foot on the Moon 47 years ago, way to go! But it’s also the 40th anniversary of Viking 1 lander, the first American probe to successfully land on Mars. The Russians got there first on December 2, 1971 when their Mars 3 probe touched down in the Mare Sirenum region. But transmissions stopped just 14.5 seconds later, only enough time for the crippled lander to send a partial and garbled photo that unfortunately showed no identifiable features. 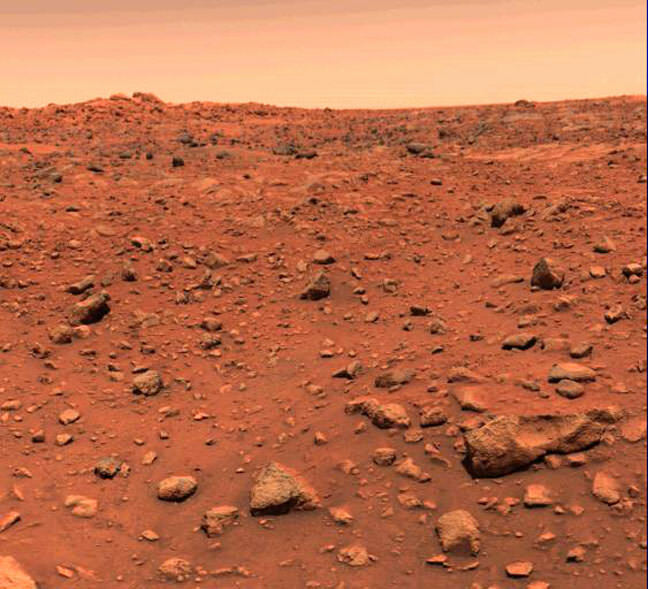 Viking 1 touched down on July 20, 1976 in Chryse Planitia, a smooth, circular plain in Mars’ northern equatorial region and operated for six years, far beyond the original 90 day mission. Its twin, Viking 2, landed about 4,000 miles (6,400 km) away in the vast northern plain called Utopia Planitia several weeks later on September 3. Both were packaged inside orbiters that took pictures of the landing sites before dispatching the probes. Viking 1 was originally slated to land on July 4th to commemorate the 200th year of the founding of the United States. Some of you may remember the bicentennial celebrations underway at the time. Earlier photos taken by Mariner 9 helped mission controllers pick what they thought was a safe landing site, but when the Viking 1 orbiter arrived and took a closer look, NASA deemed it too bouldery for a safe landing, so they delayed the the probe’s arrival until a safer site could be chosen. Hence the July 20th touchdown date. My recollection at the time was that that particular date was picked to coincide with the first lunar landing. I’ll never forget the first photo transmitted from the surface. I had started working at the News Gazette in Champaign, Ill. earlier that year in the photo department. On July 20 I joined the wire editor, a kindly. older gent named Raleigh, at the AP Photofax machine and watched the black and white image creep line-by-line from the machine. Still damp with ink, I lifted the sodden sheet into my hands, totally absorbed. Two things stood out: how incredibly sharp the picture was and ALL THOSE ROCKS! Mars looked so different from the Moon. One day later, Viking 1 returned the first color photo from the surface and continued to operate, taking photos and doing science for 2,307 days until November 11, 1982, a record not broken until May 2010 by NASA’s Opportunity rover. It would have continued humming along for who knows how much longer were it not for a faulty command sent by mission control that resulted in a permanent loss of contact. Viking 2 soldiered on until its batteries failed on April 11, 1980. Both landers characterized the Martian weather and radiation environment, scooped up soil samples and measured their elemental composition and send back lots of photos including the first Martian panoramas. Each lander carried three instruments designed to look for chemical or biological signs of living or once-living organisms. Soil samples scooped up by the landers’ sample arms were delivered to three experiments in hopes of detecting organic compounds and gases either consumed or released by potential microbes when they were treated with nutrient solutions. The results from both landers were similar: neither suite of experiments found any organic (carbon-containing) compounds nor any definitive signs of Mars bugs. Not that there wasn’t some excitement. The Labeled Release experiment (LC) actually did give positive results. A nutrient solution was added to a sample of Martian soil. If it contained microbes, they would take in the nutrients and release gases. Great gobs of gas were quickly released! As if the putative Martian microbes only needed a jigger of NASA’s chicken soup to find their strength. But the complete absence of organics in the soil made scientists doubtful that life was the cause. Instead it was thought that some inorganic chemical reaction must be behind the release. Negative results from the other two experiments reinforced their pessimism. Fast forward to 2008 when the Phoenix lander detected strongly oxidizing perchlorates originating from the interaction of strong ultraviolet light from the Sun with soils on the planet’s surface. Since Mars lacks an ozone layer, perchlorates may not only be common but also responsible for destroying much of Mars’ erstwhile organic bounty. Other scientists have reexamined the Viking LC data in recent years and concluded just the opposite, that the gas release points to life. Seems to me it’s high time we should send a new suite of experiments designed to find life. Then again, maybe we won’t have to. The Mars 202o Mission will cache Martian rocks for later pickup, so we can bring pieces of Mars back to Earth and perform experiments to our heart’s content. In our galaxy, there may be, at least, tens of billions of habitable planets, with conditions suitable for liquid water on their surfaces. There may be habitable moons as well. On an unknown number of those worlds, life may have arisen. On an unknown fraction of life-bearing worlds, life may have evolved into complex multicellular, sexually reproducing forms. During its habitable period, a world with complex life might produce hundreds of millions of evolutionary lineages. One or a few of them might fortuitously encounter special circumstances that triggered runaway growth of their intelligence. These favored few, if they exist, might have built technological civilizations capable of signaling their presence across interstellar distances, or detecting and deciphering a message we send their way. What might such alien minds be like? What senses might they use? How might we communicate with them? The purposes of the newly created METI (Messaging to ExtraTerrestrial Intelligence) International include fostering multidisciplinary research in the design and transmission of interstellar messages, and building a global community of scholars from the natural sciences, social sciences, humanities, and arts concerned with the origin, distribution, and future of life in the universe. On May 18 the organization sponsored a workshop which included presentations by biologists, psychologists, cognitive scientists, and linguists. This is the third and final installment of a series of articles about the workshop. In previous installments, we’ve discussed some ideas about the evolution of intelligence that were featured at the workshop. Here we’ll see whether our Earthly experience can provide us with any clues about how we might communicate with aliens. Many of the animals that we are most familiar with from daily life, like humans, cats, dogs, birds, fishes, and frogs are vertebrates, or animals with backbones. They are all descended from a common ancestor and share a nervous system organized according to the same basic plan. Molluscs are another major group of animals that have been evolving separately from vertebrates for more than 600 million years. Although most molluscs, like slugs, snails, and shellfish, have fairly simple nervous systems, one group; the cephalopods, have evolved a much more sophisticated one. The common octopus, Octopus vulgaris, Is a cephalopod mollusc, has evolved sophisticated cognition and perception along a very different evolutionary path than have human beings and our relatives. The brain is located between the eyes. The large bulbous structure below the eyes is the mantle, a muscular organ involved in swimming. Public domain. Cephalopods include octopuses, squids, and cuttlefishes. They show cognitive and perceptual abilities rivaling those of our close vertebrate kin. Since this nervous system has a different evolutionary history than of the vertebrates, it is organized in a way completely different from our own. It can give us a glimpse of the similarities and differences we might expect between aliens and ourselves. David Gire, an associate professor of psychology at the University of Washington, and researcher Dominic Sivitilli gave a presentation on cephalopods at the Puerto Rico workshop. Although these animals have a sophisticated brain, their nervous systems are much more decentralized than that of familiar animals. In the octopus, sensing and moving are controlled locally in the arms, which together contain as many nerve cells, or neurons, as the brain. Dr. David Gire is an Assistant Professor in the Department of Psychology at the University of Washington and a behavioral neuroscientist. He presented at the Puerto Rico workshop on cephalopod intelligence. The animal’s eight arms are extraordinarily sensitive. Each containing hundreds of suckers, with thousands of sensory receptors on each one. By comparison, the human finger has only 241 sensory receptors per square centimeter. Many of these receptors sense chemicals, corresponding roughly to our senses of taste and smell. Much of this sensory information is processed locally in the arms. When an arm is severed from an octopus’s body, it continues to show simple behaviors on its own, and can even avoid threats. The octopus’s brain simply acts to coordinate the behaviors of its arms. Cephalopods have acute vision. Although their eyes evolved separately from those of vertebrates, they nonetheless bear an eerie resemblance. They have a unique ability to change the pattern and color of their skin using pigment cells that are under direct control of their nervous systems. This provides them with the most sophisticated camouflage system of any animal on Earth, and is also used for social signaling. Despite the sophisticated cognitive abilities it exhibits in the lab, the octopus is largely solitary. Cephalopod groups exchange useful information by observing one another, but otherwise exhibit only limited social cooperation. Many current theories of the evolution of sophisticated intelligence, like Miller’s sapiosexual hypothesis, which was featured in the second installment, assume that social cooperation and competition play a central role in the evolution of complicated brains. Since cephalopods have evolved much more impressive cognitive abilities than other molluscs, their limited social behavior is surprising. Dominic Sivitilli is a post-baccalaureate researcher in the laboratory of David Gire, studying responses to chemical signals by the octopus. He is the co-presenter of a talk on cephalopod cogntition at the METI International Puerto Rico conference. METI International used with permission. Maybe the limited social behavior of cephalopods really does set limits on their intelligence. However, Gire and Sivitilli speculate that perhaps “an intelligence capable of technological development could exist with minimum social acuity”, and the cephalopod ability to socially share information is enough. The individuals of such an alien collective, they suppose, might possess no sense of self or other. Besides Gire and Sivitilli, Anna Dornhaus, whose ideas were featured in the first installment, also thinks that alien creatures might function together as a collective mind. Social insects, in some respects, actually do. She doubts, though, that such an entities could evolve human-like technological intelligence without something like Miller’s sapiosexuality to trigger a runaway explosion of intelligence. But if non-sapiosexual alien technological civilizations do exist, we might find them impossible to comprehend. Given this possible gulf of incomprehension about social structure, Gire and Stivitilli suppose that the most we might aspire to accomplish in terms of interstellar communication is an exchange of mutually useful and comprehensible astronomical information. Workshop presenter Alfred Kracher, a retired staff scientist at the Ames Laboratory of the University of Iowa, supposes that “the mental giants of the Milky Way are probably artificially intelligent machines… It would be interesting to find evidence of them, if they exist”, he writes, “but then what?” Kracher supposes that if they have emancipated themselves and evolved away from their makers, “they will have nothing in common with organic life forms, human or extraterrestrial. There is no chance of mutual understanding”. We will be able to understand aliens, he maintains, only if “it turns out that the evolution of extraterrestrial life forms is highly convergent with our own”. Peter Todd, a professor of psychology from Indiana University, holds out hope that such convergence may actually occur. Earthly animals must solve a variety of basic problems that are presented by the physical and biological world that they inhabit. They must effectively navigate through a world of surfaces, barriers and objects, finding food and shelter, and avoiding predators, parasites, toxins. Extraterrestrial organisms, if they evolve in an Earth-like environment, would face a generally similar set of problems. They may well arrive at similar solutions, just as the octopus evolved eyes similar to ours. In evolution here on Earth, Todd notes, brain systems originally evolved to solve these basic physical and biological problems appear to have been re-purposed to solve new and more difficult problems, as some animals evolved to solve the problems of living and finding mates as members of societies, and then as one particular ape species went on to evolve conceptual reasoning and language. For example, disgust at bad food, useful for avoiding disease, may have been become the foundation for sexual disgust to avoid bad mates, moral disgust to avoid bad clan mates, and intellectual disgust to avoid dubious ideas. If alien brains evolved solutions similar to the ones our brains did for negotiating the physical and biological world, they they might also have been re-purposed in similar ways. Alien minds might not be wholly different from ours, and thus hope exists for a degree of mutual understanding. In the early 1970’s the Pioneer 10 and 11 spacecraft were launched on the first exploratory missions to the planet Jupiter and beyond. When their missions were completed, these two probes became the first objects made by humans to escape the sun’s gravitational pull and hurtle into interstellar space. Because of the remote possibility that the spacecraft might someday be found by extraterrestrials, a team of scientists and scholars lead by Carl Sagan emplaced a message on the vehicle, etched on a metal plaque. The message consisted, in part, of a line drawing of a man and a woman. Later, the Voyager 1 and 2 spacecraft carried a message that consisted, in part, of a series of 116 digital images encoded on a phonographic record. The use of images in interstellar communication. In 1977, NASA launched the Voyager 1 and 2 spacecraft on a mission to explore the outer solar system. Destined to wander interstellar space forever following the completion of their mission, each spacecraft carried an interstellar message encoded on a phonographic record. The message, designed by SETI pioneers Carl Sagan and Frank Drake and their collaborators, included 116 digital images. This image is intended to show extraterrestrials how human beings eat and drink. Will extraterrestrials understand such images? The limited quality of the image reflects the state of digital imaging technology in the 70’s National Astronomy and Ionosphere Center, public domain. The assumption that aliens would see and understand images seems reasonable, since the octopus evolved an eye so similar to our own. And that’s not all. The evolutionary biologists Luitfried Von Salvini-Plawen and Ernst Mayr showed that eyes, of various sorts, have evolved forty separate times on Earth, and vision is typically a dominant sense for large, land dwelling animals. Still, there are animals that function without it, and our earliest mammalian ancestors were nocturnal. Could it be that there are aliens that lack vision, and could not understand a message based on images? In his short story, The Country of the Blind, the great science fiction writer H. G. Wells imagined an isolated mountain village whose inhabitants had been blind for fifteen generations after a disease destroyed their vision. A lost mountain climber, finding the village, imagines that with his power of vision, he can easily become their king. But the villagers have adapted thoroughly to a life based on touch, hearing, and smell. Instead of being impressed by their visitor’s claim that he can ‘see’, they find it incomprehensible. They begin to believe he is insane. And when they seek to ‘cure’ him by removing two strange globular growths from the front of his head, he flees. The Mexican blind cavefish (Astyanax mexicanus) has lived in the total darkness of a cave system in central Mexico for more than a million years, and has evolved the loss of its eyes. Astyanax possess a sense that land dwelling animals lack. The lateral line sense, which is present in all fishes, allows these animals to sense their near surroundings based on pressure differences in fields of water flow around their bodies. They also have an acute sense of taste, with taste receptors on their bodies as well as in their mouths. The evolution of cave dwelling intelligent life is probably unlikely, since large brains are metabolically expensive, and food is scarce in caves. On the surface, plants capture energy from sunlight and form the base of the food chain. State Museum of Natural History, Karlsruhe. Could their really be an alien country of the blind whose inhabitants function without vision? Workshop presenter Dr. Sheri Wells-Jensen, an associate professor of Linguistics at Bowling Green State University, doesn’t need to imagine the country of the blind, because, in a sense, she lives there. She is blind, and believes that creatures without vision could achieve a level of technology sufficient to send interstellar messages. “Sighted people”, she writes, “tend to overestimate the amount and quality of information gathered by vision alone”. Dr. Sheri Wells-Jensen is an associate professor of linguistics at Bowling Green State University. She presented at talk at the Puerto Rico workshop on alternative perceptual systems and interstellar communications. METI International, used with permission. Bats and dolphins image their dimly lit environments with a kind of naturally occurring sonar called echolocation. Blind human beings can also learn to echolocate, using tongue clicks or claps as emitted signals and analyzing the returning echoes by hearing. Some can do so well enough to ride a bicycle at a moderate pace through an unfamiliar neighborhood. A human can develop the touch sensitivity needed to read braille in four months. A blind marine biologist can proficiently distinguish the species of mollusc shells by touch. Wells-Jensen posits a hypothetical civilization which she calls the Krikkits, who lack vision but possess sensory abilities otherwise similar to those of human beings. Could such beings build a technological society? Drawing on her knowledge of the blind community and a series of experiments, she thinks they could. Finding food would present few special difficulties, since blind naturalists can identify many plant species by touch. Agriculture could be conducted as modern blind gardeners do it, by marking crops using stakes and piles of rock, and harvesting by feel. The combination of a stick used as a cane to probe the path ahead and echolocation make traveling by foot effective and safe. A loadstone compass would further aid navigational abilities. The Krikkits might use snares rather than spears or arrows to trap animals, making tools by touch. Mathematics is vital to building a technological society. For most human beings, with our limited memory, a paper and pencil or a blackboard are essential for doing math. Krikkits would need to find other such aids, such as tactual symbols on clay tablets, abacus-like devices, or patterns sewn on hides or fabric. Successful blind mathematicians often have prodigious memories, and can perform complex calculations in their heads. One of history’s greatest mathematicians, Leonard Euler, was blind for the last 17 years of his life, but remained mathematically productive through the use of his memory. The obstacles to a blind society developing technology may not be insurmountable. Blind people are capable of handling fire and even working with molten glass. Krikkits might therefore use fire for cooking, warmth, to bake clay vessels, and smelt metal ores. Initially there only astronomical knowledge would be of the sun as a source of heat. Experiments with loadstones and metals would lead to a knowledge of electricity. Eventually, the Krikkits might imitate their sonar with radio waves, inventing radar. If their planet possessed a moon or moons, radar reflections from them might provide their first knowledge of astronomical objects other than their sun. Radar would also enable them to learn for the first time that their planet is round. The Krikkits might learn to detect other forms of radiation like X-rays and ‘light’. The ability to detect this second mysterious form of radiation might allow them to discover the existence of the stars and develop an interest in interstellar communication. What sorts of messages might they send or understand? Well-Jensen believes that line drawings, like the drawing of the man and the woman on the Pioneer plaque, and other such pictorial representations might be an impenetrable mystery to them. On the other hand, she speculates that Krikkits might represent large data sets through sound, and that their counterpart to charts and graphs might be equally incomprehensible to us. Images might pose a challenge for the Krikkits, but perhaps, Wells-Jensen concedes, not an impossible one. There is evidence that bats image their world using echolocation. Kikkits might be likely to evolve similar abilities, though Wells-Jensen believes they would not be essential for making tools or handling objects. Perhaps humans and Krikkits could find common ground by transmitting instructions for three dimensional printed objects that could be explored tactually. Wells-Jensen thinks they might also understand mathematical or logical languages proposed for interstellar communication. The diversity of cognition and perception that we find here on Earth teaches us that if extraterrestrial intelligence exists, it is likely to be much more alien than much of science fiction has prepared us to expect. In our attempt to communicate with aliens, the gulf of mutual incomprehension may yawn as wide as the gulf of interstellar space. Yet this is a gulf we must somehow cross, if we wish ever to become citizens of the galaxy. P. Patton (2014) Communicating across the cosmos, Part 1: Shouting into the darkness, Part 2: Petabytes from the Stars, Part 3: Bridging the Vast Gulf, Part 4: Quest for a Rosetta Stone, Universe Today.